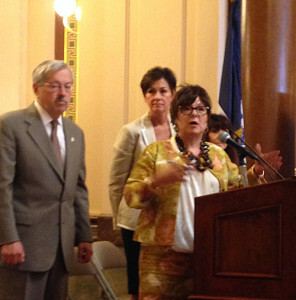 Economic Development Authority director Debbi Durham with Governor Branstad and Lt. Governor Reynolds. Officials from Davenport, Cedar Rapids, Marion, Norwalk, Perry and Mason City joined Branstad at a statehouse news conference to tout the new designations. Chad Schreck, the president of the North Iowa Corridor Economic Development Project, was there. He says it was an “arduous process” that took nearly two years to complete. Mason City spent about $50,000 to ensure the 175 acre site was “shovel ready” for light industrial use and Schreck says they’ve already had some interest. Officials in Sioux City also spent the past couple of years with the same checklist to establish a “project-ready” site and in May developers picked that site as the place where they’ll build a new, $264 million pork processing plant that will employ over a thousand people. Iowa Economic Development Authority director Debi Durham called that a “site perfect” project. Last year, sites in Fort Dodge, Iowa Falls, Dexter and Van Meter won “project ready” status, but none have landed a project yet.